Crisis on 52 Reboots: What if Everyday Gods had Started Today? As I mentioned, DC comics is rebooting it’s entire line of comics starting this week with the first of 52 comics starting at #1 again. This got me thinking about what I have changed in my style and how it has improved due to practice and equipment upgrades. Unfortunately the one thing I still lack is time. 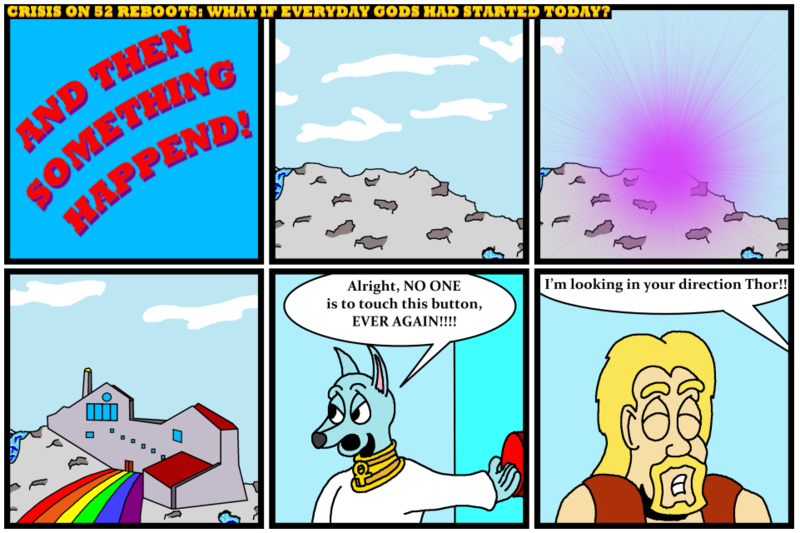 However, to find out how I have changed, I recreated Everyday Gods comic 1, using the same script, I just updated the look. Personally, I think it does show the improvements over the years. Come back Wednesday for Everyday Gods, the Manga style where I will recreate one of my favorite strips from the beginning in a Manga style, and Friday…. well I am not sure to how to explain Friday…. but it will involve a puppet!